Fashion week returns to Orlando’s Mall at Millenia this month. From September 6 through September 23, participating mall retailers will highlight exclusive merchandise, launch new lines, unveil special promotions, and host champagne receptions. There will also be several mall fashion shows. The event kicks of on the 6th, with Fashion’s Night Out. Starting at 6pm, participating stores will feature things like special activities, gift with purchase rewards, and sweepstakes for shoppers. For more details about Fashion Week 2012, and a schedule of events, visit The Mall at Millenia website. 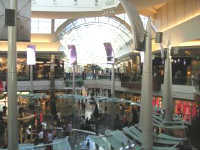 The Mall at Millenia is located at 4200 Conroy Rd in Orlando. Phone is 407-363-3555. This is fantastic news for local businesses. This event will really help to boost the local economy.